It’s time we break the silence ! Since the last post, your host has arrived on the team. I am excited to bring my experience in Video, Linux, and Web development that I gained during the last years at STVS, another amazing company. But for now, let me tell you of the latest updates on the PandaStream platform. After our ruby 1.9 migration, the average page response got divided by two, down to around 350ms. Missing, is the /cloud page that still takes around 1 second to load so that is something we are going to work on next. 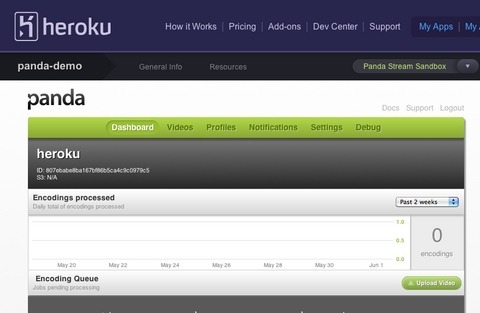 For the Heroku customers ; you can now access to a specialized version of our interface by logging into Heroku and choosing the Panda Stream Add-on. This can be handy if you want to follow visually the progress of your encoding and get real-time notifications. You can also access it by typing the following command in your console. Enjoy ! After we updated our FFmpeg build, we saw almost a double speedup for the WebM encodings. This brings WebM up to speed with the h.264 transcoding. Next, we will publish some encoding speed results for your eyes so that you can compare our platform to our competitors. How to use ? Just add the following script to your page and you are ready to go ! A big props goes to the awesome JBundle which we use to package and distribute the uploader to the CDN.